Another state conference has come and quickly passed! Indiana’s 2017 Fall State Conference at Indiana Wesleyan was full of our favorite conference events including sessions, featured artists, banquet and membership luncheon. It also hosted a new and exciting format of sessions called lightning sessions where 6 presenters presented a 5-minute “lightning” sessions in one hour slot. If you were lucky enough to join us or if you had to sit this one out, enjoy these highlights and we’ll look forward to seeing you at the 2018 conference October 5-6, in Fort Wayne at Sweetwater Sound! Be sure and follow the IMTA Facebook page to keep in touch with the most up-to-date happenings! 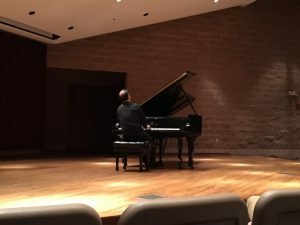 Award-winning pianist Aviram Reichert performed a solo recital and presented an advanced piano masterclass. Reichert is a former medalist of the prestigious Van Cliburn International Competition. Congratulations to former Butler Collegiate Chapter MTA member Karen Lien, winner of the Mary Sue Harris Fellowship, awarded annually by MTNA! 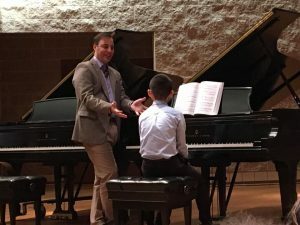 The $3,000 grant, funded by the MarySue Harris Endowment Fund, is presented annually to a recently graduated independent teacher who demonstrates commitment to the music teaching profession and outstanding studio development. Holland is an award-winning professor and director of the Division of Music at the Southern Methodist University. He has presented hundreds of lectures and recitals throughout North America, Europe, Asia, and Australia. His articles have appeared in every major English language professional keyboard journal and he is the author of over seventy critically acclaimed method books and recordings published by Alfred Publishing Co. and the Frederick Harris Music Co. Dr. Holland is executive director of the Frances Clark Center for Keyboard Pedagogy.